To botox, or not to botox… that is the question. Botox seems to be something that splits opinion. When I talk to my boyfriend, friends and family about it, it elicits pretty much the same response in them all – they think it’s ridiculous that such a thing has even crossed my mind, especially at my age. My friends are very good at listening and supporting, but you can see by their expressions that they think I’m slightly crazy for considering the treatment. But regardless of this I have becoming increasingly conscious of the ‘smile lines’ that have appeared around my eyes, I’ve noticed them since my late teens but over the last year or so have become worse and worse. Don’t get me wrong, I have no problem with having some character on my face but the fact that I can see these lines starting to move further down onto my cheeks makes me very self conscious. Moving towards using injectable solutions isn’t a first solution, I have been using anti-ageing eye cream since I was about 21 and obsessively hydrate the eye area (I have been using a couple of fairly impressive products recently that I will blog about soon). But I also know that the problem isn’t easy to tackle as I’m confident it’s genetic – I hope my siblings wont mind me mentioning this… but my younger brother (who is 19) and my older sister (in her 30’s) have similar fine lines in the same places. Whilst this may be expected post 30, but when my teenage brother has the same thing and I do in my mid twenties it’s fairly safe to say that there must be something genetic behind it (none of the three of us smoke by the way). So anyway, long story short is that I have premature wrinkles under my eyes, it’s making me self conscious and I want to do something about it. Not something so others will notice, just something so I can feel and see the difference. This is where The Private Clinic of Harley Street steps in. I was contacted by their PR a while ago asking if I wanted to ask their expert some questions and ended up booking a consultation appointment to have a chat with a nurse about skin and ways to treat the problem. I had no hesitation in going for a chat with the nurse – until I found myself walking down the infamous Harley Street thinking about needles and scalpels and all sorts of horrendous ‘extreme surgery programmes’…. Of course that was just my overactive imagination kicking in. When I walked into the Clinic I found it welcoming and luxurious without feeling too ‘clinical’. Staff were friendly and didn’t look like blown up Barbie dolls – so that was nice. I sat in the chandelier-clad waiting room filling out a form and noted that the other patients all looked very normal – not a sunglasses wearing celeb-type with suspiciously bruised nose in sight. There were a couple of men and about three women waiting to be seen. The nurse, Wendy, came to find me and took me through to a treatment room for a consultation (this isn’t the usual setting – they have dedicated consultation rooms but they were all booked) and we sat down for a chat. Wendy had a look at the lines I have mentioned and explained the different options – covering costs, pain factor, the amount of recovery time needed and any risks associated. Wendy recommended that botox would be the cheapest and most effective solution to soften the lines and prevent them from getting deeper as my collagen levels in my skin deplete with age. She also covered another injectable solution of hyalauronic acid (an intense moisturiser – like the Dermalogica one I recently reviewed) but this needs more frequent treatment and costs more per time. I was given ample time to ask questions and didn’t feel rushed at all. I was offered the chance to book in for treatment that afternoon if I wanted – but not put under pressure to do so. I chose to go away and think about it before committing. I think that going along for a no-commitment consultation is an excellent idea if you are considering something such as botox, or even surgery. It’s a way to get all the answers you need to make sure you are informed enough to make the choice to go ahead or go another route – and as I said, I didn’t feel pressured either way. Now the tough choice is – which road do I go down…. It’s up to you. I’m 55 and luckily don’t yet have many lines. My mother is holding up well and that’s a key indicator. I have always looked after my skin. I don’t find Botoxed women attractive (I’m gay so that’s why I’m going anonymous although I’m a regular contributor) whereas I do find women with character compelling. Depends how you want to look. I equate Botox with bimbo. It’s one thing being well-groomed but Botox! To me it’s a wicked expression of vanity. And those frozen faces. Not nice. You don’t look old or tired at all! I’ve never noticed these so-called smile lines you mention! I’ve seen so many bad cases of botox and fillers that I am personally put off by having either done. More often that not, it looks really obvious when a person’s face doesn’t move properly… even if it’s just a subtle difference. And I know someone who got a proper black eye once too from the botox needle hitting a capillary. Ouch! Fillers can sometimes look a bit suspect too (although I have seen some amazing before and after pictures where it has been really effective without looking weird). But I suppose botox at least slows down the lines deepening, whereas fillers just temporarily plump out the lines. Anyway, I think you look gorgeous as you are and don’t need any “injectables”! Thanks for the comment – I think this is all part of the debate. The main issue I have is that if I was a few years older the lines wouldn’t bother me, but at the age I am I feel they make me look older an more tired than I am. I definitely don’t want to go down the bimbo route- especially being blonde, it’s something I’ve actively avoided my whole life (I don’t wear pink much for that reason!) so that is one of the debates. I’ve never noticed any lines around your eyes at all. It is a personal choice, though, and if it makes you significantly unhappy, go for it – but bear in mind it might be one of those things you are amplifying in your mind, and is a lot less noticeable than you think it is! It’s definitely not something I want to rush into at the moment. Just considering it as an option – the most intimidating thing about it, is the fact that once started it’s probably a long term commitment (if I like the results) and that will definitely put me off taking the plunge before properly thinking it through. Hi! Thank you for your review. We are pleased you enjoyed your consultation at The Private Clinic. 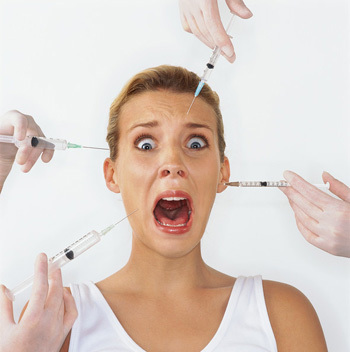 Our doctors and nurses are very aware of the anxiety you may feel about Botox or any cosmetic treatment. We have patients who see Botox as nothing more than a hair cut but also many who have lots of questions and concerns about it. It is for this reason why we offer the free consultation where we try to be as detailed as possible and provide treatment options and advice. The decision to go ahead is then very personal, especially because, as you said, there are people blessed with very good skin even in their late fifties (lucky them!) and people who get the first lines very early on. Botox needs to be done on a regular basis other wise theres not much point. You may as well just use retin-A and sun block prob will do just as good.. This is a great article . Thanks for sharing this information. I know The Private Clinic is a good clinic .